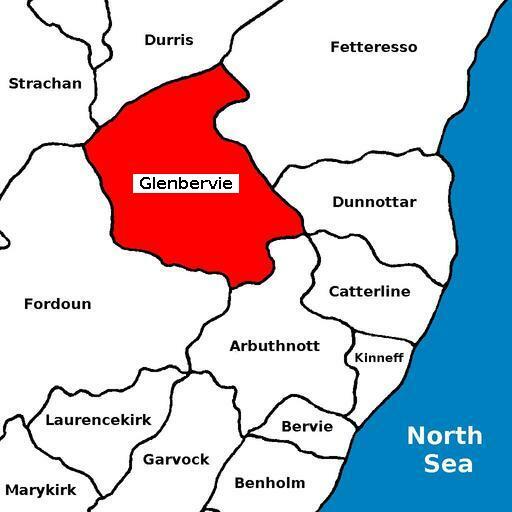 For the full range of maps of Glenbervie, see National Library's Maps. 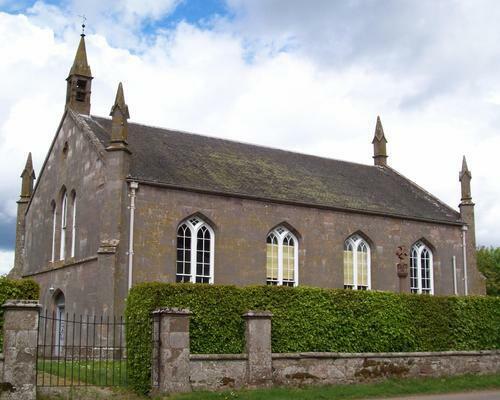 Geograph.org: Glenbervie - recent photographs of Glenbervie. National Grid ref. NO7680. Geograph.org: Drumlithie - recent photographs of Drumlithie. National Grid ref. NO7880. Located at NO766807. Built in 1826, a "barnlike building on a cheerless site". No monuments other than the war memorials. 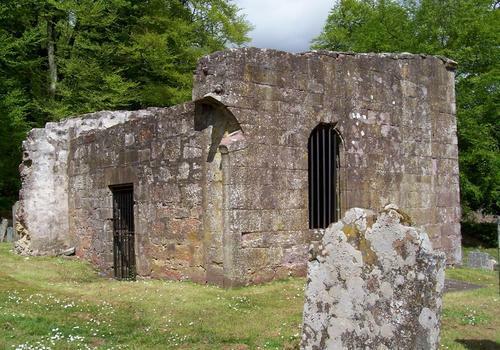 The ruined former kirk, which was dedicated to St Michael the Archangel, is now the Glenbervie Aisle, the burial vault of the lairds of Glenbervie. It is located at National Grid ref. NO767804. There are also memorials to Burness ancestors of Robert Burns in the kirkyard. Above: views of the monument within the Glenbervie Aisle. The monument is an assemblage of parts, in imitation of an altar and reredos. 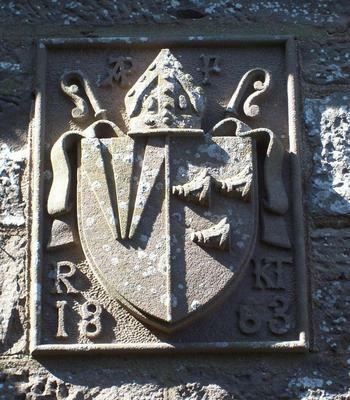 It commemorates William Douglas, 3rd of Glenbervie, who succeeded as 9th earl of Angus and died on 1 Jul 1591, and his wife Dame Geillis Graham. For full details, see Davidson, pp. 26-8, and Andrew Jervise, "Epitaphs & Inscriptions", vol. 2, pp. 344-5. 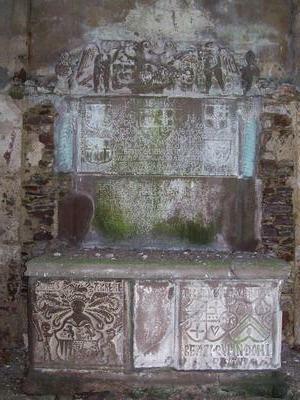 The photographs seem to show four piles on the 3rd quarter of the arms on the left-hand panel of the chest, representing the lordship of Jedburgh Forest, rather than three as stated by Davidson. Also, the letters flanking the two shields on the right-hand panel of the chest, given as VD and DG by Davidson, seem rather to be V DG G, cleverly combining VDG (William Douglas of Glenbervie) and DGG (Dame Geillis Graham). Built 1863. No longer in use. There are photographs of the church and some monuments in the churchyard at Drumlithie Churchyard. The coat of arms on that page appears to be that of Alexander Penrose Forbes, as Bishop of Brechin. 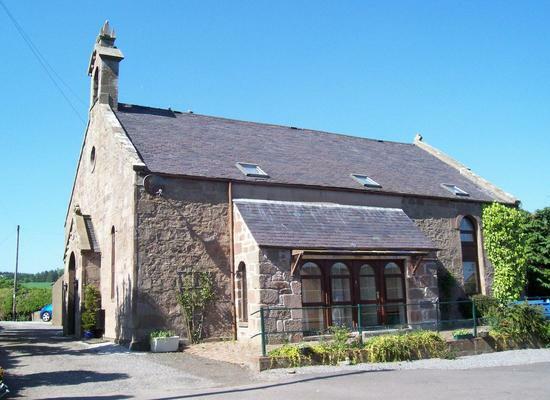 See also Drumlithie Episcopal Church. Robert Masson Boyd ?-1881-1905 b. ca. 1846 Kilmarnock AYR; d. 20 Oct 1905 Glenbervie; mar. Mary Falconer ---; issue: Wm F.; John B.; Mary F.; Thos C.; Euphemia A.; Kath. F.; Eliz. J; Robt M., M.B., Ch.B. ; Annie E.
James Gammack ?-1871-1881-? M.A. ; b. ca. 1837 Turriff ABD; mar. Jane Anne Wilson; issue: Mary C.; Alexr P.F. ; John W.; Arthur J.; Geo. W.; Fredk S.
George Lawrence Bell ?-1901-? b. 21 May 1864 Leith, son of Lawrence R. B. 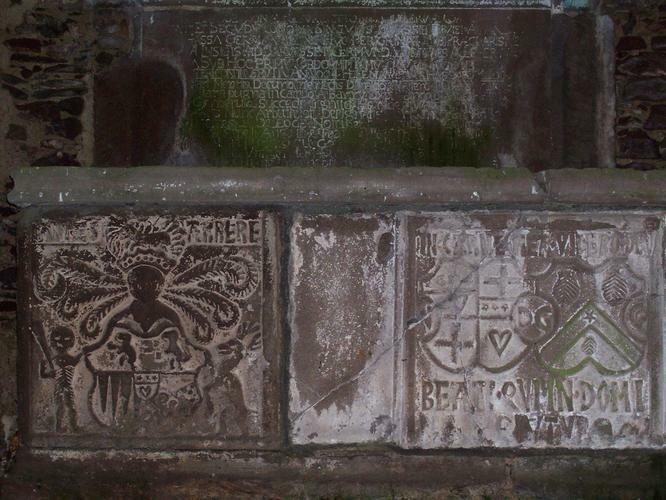 Full texts of all extant inscriptions in Glenbervie Kirkyard have been published by the Aberdeen & North-East Scotland FHS. They have an online search facility for names of people on the monuments they have recorded. Their list of publications is here. Andrew Jervise recorded some monuments at Glenbervie in his "Epitaphs & Inscriptions", vol. 2, pp. 344-9. Pte. James Farquhar. 1st Batt. Pte. George MacCurroch. " "
Pte. E. Forsyth. 2nd "
Pte. Robert Benzie. 3rd "
Pte. George Greig. " "
Pte. Alex. Thomson. " "
Pte. John F. Murray. 4th "
Pte. Leith Simpson. " "
Pte. William Inglis. 5th "
Pte. Arthur Brand. 7th "
Pte. James MacCurroch. " "
Pte. Fred. Meston. " "
Pte. James Pratt. " "
Pte. Alex. Willocks. " "
Lce.Cpl. John Willocks. 8th "
Pte. John Johnstone " "
Pte. George Selbie. " "
Pte. Frank Thomson. 17th Batt. Pte. George Donald. 10th Batt. Cpl. Alex. Kinloch. 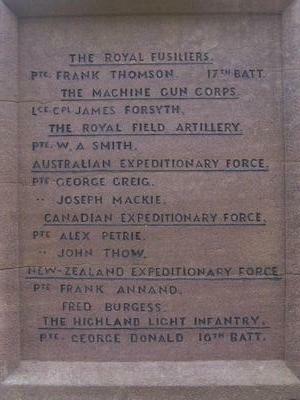 1st Batt. Pte. Alex. Wood. 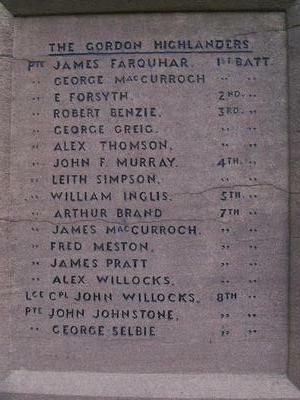 3rd Batt. Pte. Robert Murray. 10th Batt. Pte. Andrew Balnaves. 6th Batt. Lce.Cpl. Alex. Smith. 10th Batt. Cpl. James Collie. 5th Batt. Pte. W. F. Ross. 7th Batt. Gunner Robert Howie - R.N. Gunner Douglas Munro - R.A.
L.A.C. Charles Shivas - R.A.F. Pte. Richard Simpson - R.A.O.C. 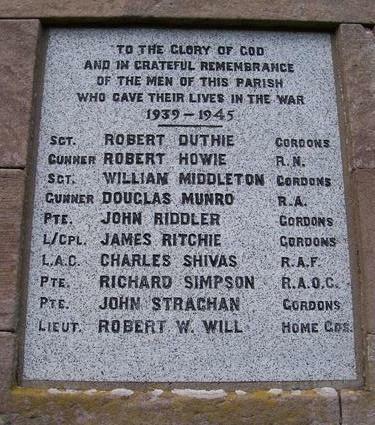 See also Scottish War Memorials Project: Glenbervie for further photographs and details. 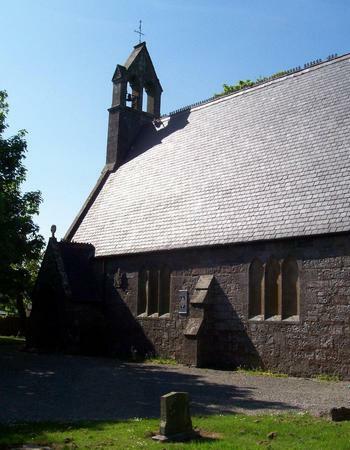 Burial records for Glenbervie are held by the Registrar in Stonehaven. See Kincardine and Mearns Burial Grounds. 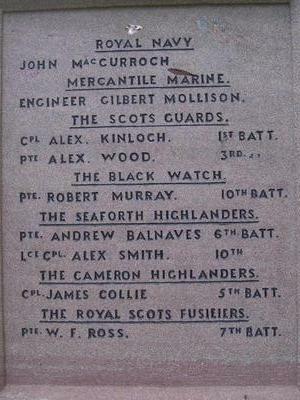 Glenbervie was in the Commissariot of Brechin.